Saturday afternoon we returned home after spending a week in Florida. 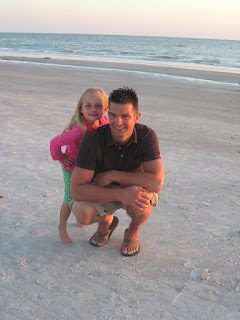 We went to Indian Shores which is just minutes south of Clearwater. The condo we rented was great, steps to a great pool area or to the beach. We had unbelievable weather with lots of sun and temps in the mid to upper 80's! 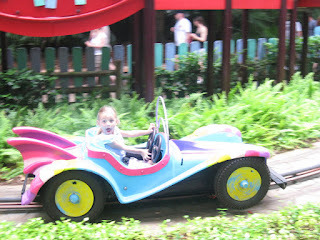 Monday was overcast with a chance of rain predicted so we headed to Busch Gardens. Jenna loves seeing all the animals and going on the train ride through the Animal Safari. We headed to all the "theme" areas of the park and after lunch found Dragon Land which was everything kids! It was not busy so she went from ride to ride taking it all in. I was impressed that she didn't hesitate a bit to do them all by herself. 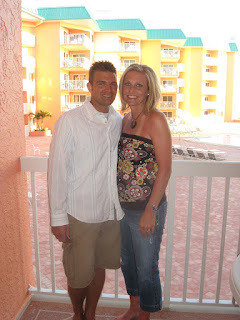 Dave and I were able to go out for one date night since my mom was along and stayed with Jenna at the condo. 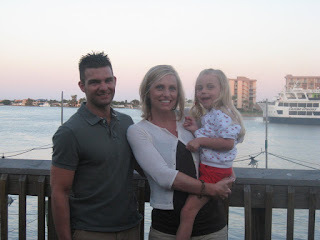 We headed to Bubba Gumps at St. John's Pass Boardwalk. It was a really nice night to get away. 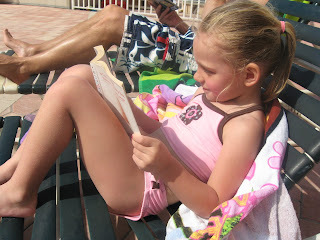 Jenna loved heading to the pool in the morning to swim. 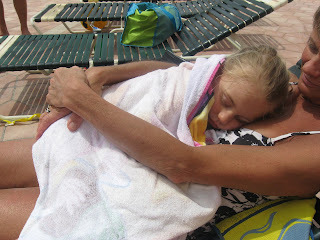 By the middle of the week she wanted nothing to do with her life jacket and was jumping in and swimming underwater! I have to admit it's a little creepy when she's swimming towards you under water with her eyes open looking right at you! 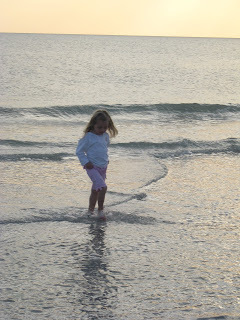 After lunch we'd usually head to the beach for a couple hours where we'd play in the sand and jump the waves....she would laugh so hard that anyone around her would start to laugh. 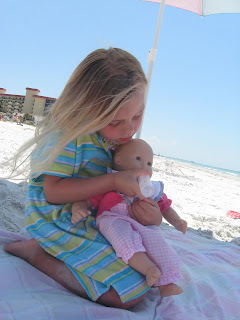 It would have been nice for her to have a little friend along to play with but she kept busy! Driving there and back went great and she was a trooper being strapped in her seat for 20 hours. She slept all through the night and would color, read books and watch DVD's when awake. She did get carsick once on the way down but we're chalking that up to waking up and being very hungry and warm....guess she has my carsickness. Definitely a great week! Now it's back to reality and all the things that keep life busy at home. We're still moving forward with the house and hope to get started in a couple weeks. Everything is going well with the pregnancy and it's unbelievable that I have less than 18 weeks to go! Dave leaves in the morning for two more weeks in Connecticut so Jenna and I will have to keep busy to make the time pass quickly. Watching for Dolphins off St. John's Pass Boradwalk. Jenna thought it was great! 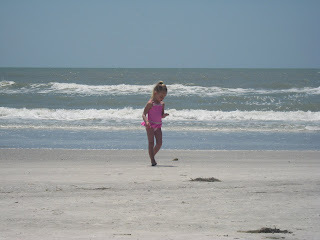 Looking for sea shells...she found lots! 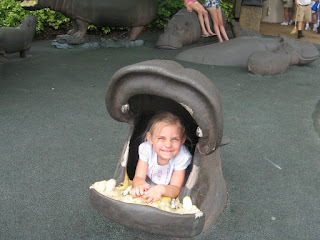 Jenna in the Hippos mouth at Busch Gardens! 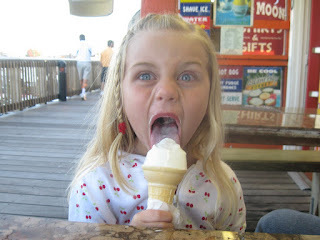 This girl LOVES ice cream!!! All tuckered out from all her swimming. Love this picture. Jenna had to do her diva stance and dave just laughed! Uggh! I am SO jealous! It looks like you had a blast, and I am sure miss Jenna had a ball too. Glad to hear she did so well in the car and everything. By the way-love your new blog backgroud! Cute!